This month’s food feature begins with a well-considered prediction. For the last few years, the fastest growing trend in beverages consumed by Americans has been a Taiwanese creation known as ‘bubble tea’, no doubt due to a prior influx of Asian immigrants (from Taiwan, Japan, Vietnam & The Philippines) who all grew up on what is often described as ‘chew drinks’. Currently, the fastest growing segment of our population is highly educated, English-speaking East Indians, who have distinguished themselves in the fields of medicine, high-tech, media, and the hotel industry. Also worth noting: the wide acceptance of yoga, the concept of karma, and Asian techno music…even Bollywood films have become a component of modern American life. The relative ease of their assimilation and the inherent richness of the culture they bring with them (India is also the ‘spice epicenter’ of the world), is producing a kind of perfect storm for hipsters, foodies, chefs, and entrepreneurs coast to coast. For many decades now, the second most popular food in America has been Italian. What is more comforting (aside from BBQ & potato salad, of course), than a huge piece of cheesy pizza or heaping plateful of tomatoey pasta? The answer in 2010 might just be curry, dal & naan w/ a mango lassi drink thrown in! In fact, I feel fairly confident in predicting that Indian cuisine will become the new Italian (or if you’re from the Southwest, the new Mexican) for the under-35 set. I’m even willing to bet on the frothy yogurt & fruit-based ‘lassi’ becoming the new bubble tea! With Houston and Ft. Worth/Dallas being two of the largest centers of Indian population in the country, it was inevitable these smart folks would eventually gravitate to The Heart of Texas, Austin. Most of the newer Indian eateries have been popping up on the north side of town, but now South Austin can boast its own stellar addition: Tarka Indian Kitchen, nestled in the new Sunset Valley Mall (on the south side of Hwy-290, east of Brodie Lane). I’m equally enamored with a cozy little Parmer Lane shop called Curry In Hurry that opened in 2006, an extension of The Gandhi Bazar specialty market next door. The latter is a homey, purely vegetarian operation; the former, a more sophisticated venture with both vegetable and meat offerings on the menu. But each is truly authentic, very affordable, and well executed in its own right. If you happen to live in the center of town, next time you feel an uncontrollable urge for curry, take a short drive. TARKA Indian Kitchen (Upscale Casual/counter service/nothing over $10) The name literally translates to ‘the sizzle of freshly sautéed ingredients’ and that’s exactly what you’ll find at Tarka. The brainchild of Tinku Saini & Rajina Pradhan (who previously owned Clay Pit) and new partner/chef Navdeep Singh, they agreed from the start to only use fresh ingredients and never ‘dumb down the flavors’ just to please inexperienced palates. Instead, they offer customers three levels of heat to choose from - the perfect solution for a fast food café with plans of multiplying throughout Texas. Remarkably, each dish is made to order (which means there’s little waste at the end of the day), and delivered to the table in less than ten minutes. The food is vibrant and colorful, as are the sleek surroundings. Photos of an Indian marketplace, shapely blown-glass fixtures, and modern Indian music (from Tinku’s own collection) all serve to enhance the tantalizing aromas that fill the air. The well-organized counter menu features many familiar items: fried pakoras & stuffed samosas, savory soups & lentil dal, five distinct curries, tender kabobs, and rice biryanis. 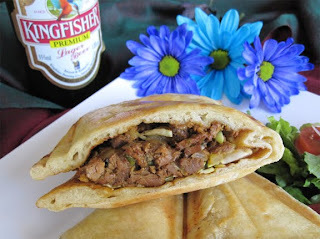 However, you’ll also find some innovations like the ‘naanini’ – similar to a French Panini (sandwich) but using Indian naan (flat bread made in a tandoori oven) filled w/ spicy meat or vegetables. The shredded lamb version is a zesty, melt-in-your-mouth home run and is accompanied by a generous green salad w/ a sweet tamarind dressing or yogurt/cucumber ‘raita’ (on request). The Samosas are puffy golden pyramids of potato & veggie goodness. The tomato-based Madras Soup is rich & tangy w/ just the right amount of coconut. Their classic Chicken Saag is chock full of freshly sauteed spinach; and the creamy Lamb Korma is made with 3 kinds of finely ground nuts. The Malai Kofta (vegetable dumplings in tomato & onion curry) and Dhingri Mattar, made w/mushrooms, peas & paneer (cheese), are two of my favorite vegetarian dishes (many others are vegan or gluten-free). There are some unusual drinks as well. Along with the traditional Chai Tea and iconic Kingfisher Beer, there’s a refreshing, serve-yourself Mango Lemonade and 3 flavors of ‘Whipped Lassi’ (mango, guava & mixed berry), produced right at the counter so customers can watch. Another important component of Tinku & Rajina’s vision for Tarka (fostered by their good friend, Manu) is a total commitment to using eco-friendly, compostable plates, utensils and take-out packaging, as well as recycling all their paper, plastic, glass & aluminum. They even include detailed information on their website to encourage customers & other restaurants to follow suit. Though I’ve never been a fan of chain restaurants before, this fast, fresh, flavorful and eco-friendly model is one that deserves repeating. 5207 Brodie Lane (next to ZEN), 892.2008. This modest but nonetheless charming eatery is attached at the hip to its Indian-market-parent, The Gandhi Bazar. Owner Jinesh Gandhi, who comes from a background in electrical engineering and software consulting, realized after being laid off a few years ago that he loved to cook! Using a successful model common to the ‘India Towns’ of most major cities, Jinesh has dreams of opening several more of his market/take-out restaurants throughout Texas. In contrast to Tarka, the food at Curry In Hurry (there’s no ‘A’ in the name), is strictly vegetarian and changes daily according to what Jinesh has cooking. Although he focuses on dishes from the region of Rajasthan and Gujarat (where he’s originally from), he’s recently added some South Indian staples like ‘idli’ and ‘vada sambhar’ to the menu. But the stand-outs are his home-style curries made w/ authentic ingredients like Asian okra, eggplant, cluster & valor beans (a kind of Indian snap pea), and whole- roasted chilies & other spices; the vegetable or paneer stuffed ‘paratha’ breads; and a dozen varieties of the popular street snack ‘chaat’ (fried breads topped w/ various savory ingredients & served with 2 kinds of chutney). For a mere $5.99, the lovely Binta (who works at the counter) will assemble a combo plate that includes one curry (there’s usually 4 to choose from), a cup of dal (the ‘toor’ version is exceptionally aromatic & delicious), a generous portion of basmati rice, and 2 pieces of parathi or 4 roti (both of which are handmade in the kitchen). I also love being able to order a ‘salty’ lassi to go with my meal, instead of the mango version more familiar to Americans. Having traveled extensively through India, Jinesh’s food is a warm reminder of the many meals I shared with Indian friends and families. 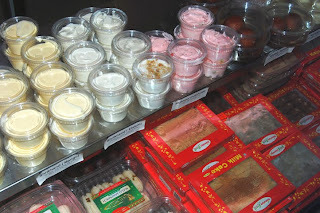 Another welcome feature of Curry In Hurry is an Indian dessert case stocked with hard-to-find treats such as freshly made ‘rasmalai’ (paneer cheese floating in a pool of sweetened cream), and the even rarer ‘shrikhand’ (similar to a mousse or panna cotta, but made w/ concentrated yogurt). It comes in 4 flavors – saffron pistachio, mango, mixed fruit, and cardamom, and Jinesh says it’s been flying out of the case since he started offering it. And no wonder - at only $2 its sheer ecstasy in a cup! Although Curry In Hurry is primarily a take-out restaurant (they also do catering), there are a few tables to sit at as well. I highly recommend eating in and lingering for a while, to get a better idea of all the treasures contained here. 2121 W. Parmer Lane, 837.9701.